The Nabam Welfare Society (NWS) called on Chief Minister Pema Khandu today. Nabam Runghi, the first agency councillor of NEFA administration, who is credited for selection of Itanagar as the state capital also accompanied. In a brief meeting that followed, Runghi narrated how he was able to convince the then governor of Assam, B K Nehru to choose Itanagar as the state capital. Places such as Pasighat, Basar and Yachuli were other potential sites identified for state capital but lost the race to Itanagar due to his persuasion coupled with high compensation demands, Runghi claimed. The Chief Minister appreciating his contribution in making Itanagar as the state capital, assured to take up the pending request of NWS for according recognition to Runghi. NWS had earlier proposed for a state level felicitation on a day of state importance, life-time honorarium and land allotment within the capital city to Runghi. The CM assured that the matter will be taken up in the cabinet meeting to be held on December 8 next and a collective decision will be taken in this regard. 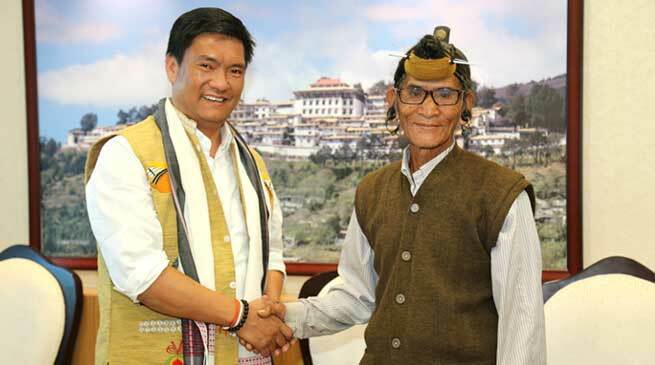 On a related note, Khandu informed that the state government has sanctioned Rs 1 crore for a football stadium in Pakke Kesang, which will be named after late Nabam Tajam for helping establish the Pakke Kesang administrative headquarter in 1966.